Here's an understatement — Airplanes are noisy. Just ask anyone who’s taken a flight, and they’ll tell you about chatting passengers, crying babies and roaring engines. It’s not easy trying to catch some ZZZ’s in this type of environment. Is it any wonder that so many people experience anxiety when trapped on a plane cruising at an altitude of 35,000 feet? Couple this with being wedged into a cramped seat with no elbow (or leg) room, and you have an extremely uncomfortable situation. 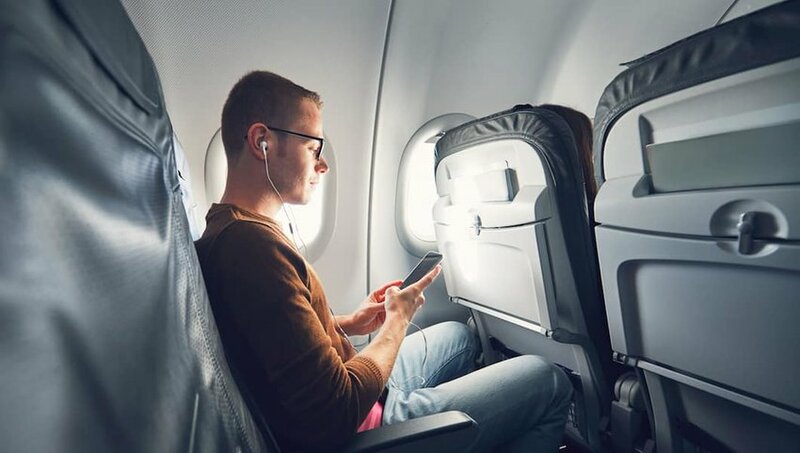 Even if you have the money to spend on a business-class ticket, you quickly realize that most of those reclining seats don’t lay completely flat. So what’s a bleary-eyed traveler to do? Read on for tips to get some shut-eye while flying to your next destination. The overwhelming favorite is the Bose QuietControl 30 wireless headphones. They feature a design that eliminates some of the pressure associated with other headphones when they’re fitted on your ears. If you sleep on your side, check out SleepPhones. They sit over the ears, allowing you to dream away while you snooze on your side. 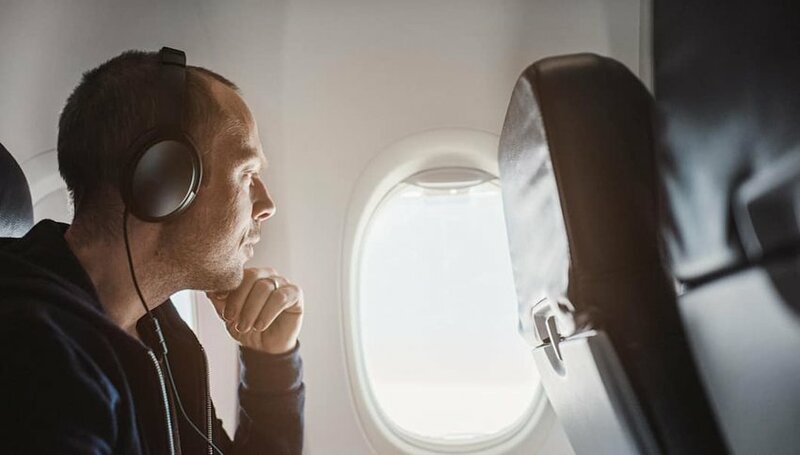 Not only do these kinds of headphones cancel out noise, but they also connect to bluetooth so you can listen to relaxing music as you fly the friendly skies. It looks like a stylish scarf. But, in reality, it’s a travel pillow equipped with a blanket. Unzip the hidden compartment on the Sleeper Scarf, and you’re greeted by a valve used to pump up the pillow with just a few breaths. The cushion is adjustable so you can get it just the way you like it. When you land, simply release the valve. The pillow deflates in just a few seconds. So this travel pillow is basically a marriage between style and comfort. You’ll look good while you slumber away. Even better, you’ll avoid leaning on your seatmate (and drooling on him too). The restful smell of lavender can help you drift off to sleep. Try purchasing something like the Sunshine Pillows Lavender-Scented Travel Neck Pillow. This particular pillow features a pouch stuffed with dried Washington lavender buds. Place it inside the neck insert and the delicious smell of lavender will ease you into a tranquil sleep--even if you’re stuck in an economy seat. If you don’t want to travel with a special pillow, buy some lavender essential oil. But don't just buy any brand. Be a smart shopper and choose essential oils with an ingredient list where the oil and a carrier oil are the only ingredients. This ensures the oil is a superior quality. When you board the plane, place a few drops of the lavender oil in your hands and inhale the fragrance. Next, rub it on your temples or wrists. DoTERRA and Plant Therapy are two well-known brands you may want to try. Just because you close your eyes doesn’t mean light can’t reach them. And many people need absolute darkness in order to fall asleep. Light streaming through a window or from an overhead reading lamp prevents the release of melatonin, a hormone that helps you sleep. 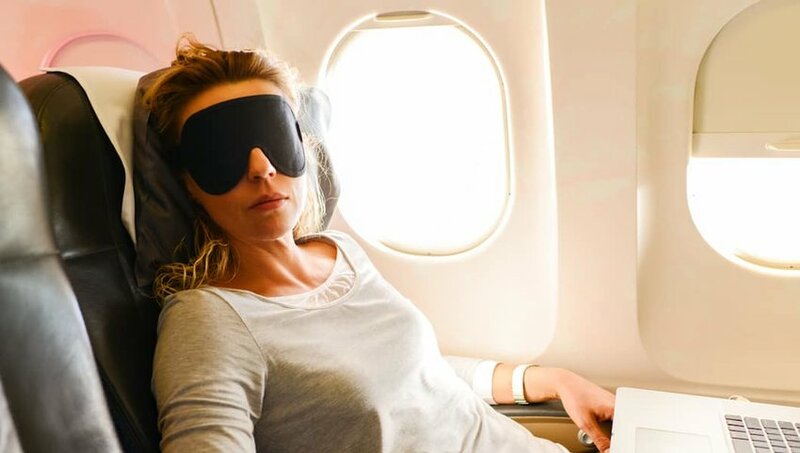 Solve the problem of too much light in the airplane cabin by purchasing an eye mask. If you don’t like anything pressing against your eyelids try an eye mask with molded cups. Before you know it, you’ll be channeling your inner Holly Golightly and sleeping like a baby. An excellent way to make sure you’re relaxed and ready for some shuteye is to don some comfy socks right before the plane takes off. Whether you prefer compression socks, cashmere socks or your favorite patterned socks you wear when you want to get cozy, find a pair that keeps your feet warm so you’re more likely to nod off. Instead of reaching for potentially dangerous sleeping pills, reach for a melatonin supplement. Melatonin can often be useful if you’re on a flight, especially if it’s a flight that crosses through several time zones. You only need about 1 mg of the supplement, and if you take it half an hour before you want to fall asleep, you may be less likely to lay awake all night. Melatonin is a natural supplement and offers fewer side effects than sleeping pills. But, as with any supplement, you should first run it by your doctor before taking it. When you've got your headphones pulled tight over your ears, what are you going to listen to? Maybe you've got a soothing playlist of piano music or a podcast to help lull you to sleep. But if you're still struggling, consider downloading a relaxation app. There are plenty on the market featuring everything from guided mediations to white noise or the sound of the ocean. One of our favorites is the Calm app, which includes meditation lessons, relaxing music and bedtime stories to lull you to a gentle and peaceful flight.